# Despite recent correction from the RM4.00 region, its medium to long term uptrend remains intact as share prices continue to stay above the 100-d (now at RM3.55) and 200-d (RM3.33) SMAs and lower Bollinger band (RM3.60). # Although there could be further consolidations amid volatile markets and its high foreign shareholding, any price weakness is an opportunity to accumulate for potential rebounds later as technical readings are on the mend. 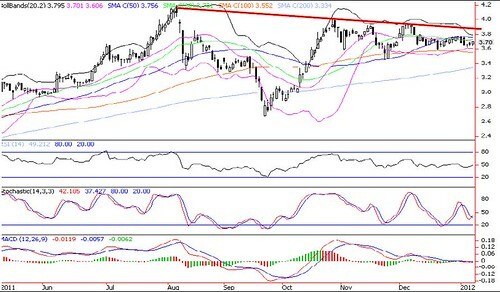 # Immediate resistance levels are RM3.76 (50-d SMA), RM3.80 (upper Bollinger band) and RM4.00. Supports are RM3.55-3.60. # Cut loss below RM3.55.